Emerson's CK5859 shower radio wakes you up better than a cold shower. The shower radio features an AM/FM radio with a slide rule tuning dial and rotary volume, band selection and tuning controls. Shower radio ha a digital clock with easy-to-set direct entry time setting, and will light-up automatically when any key is pressed. Keep yourself on time in the morning using the auto shutoff feature. The auto shutoff can be programmed to automatically turn off the radio from one to 99-minutes - which can be used to help time your shower for a specific period of time. The radio will play until the timer counts down to zero, after which an alarm will sound and the radio automatically turns off, reminding you to get out of the shower. You can manually turn the radio off using the reset button. 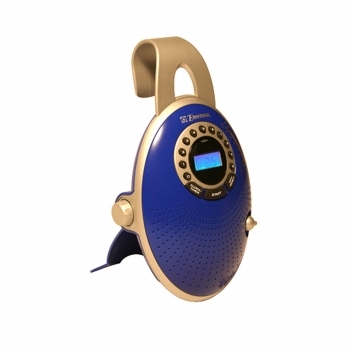 The wide-range 2.25-inch Mylar speaker offers a loud, crisp sound and is splash resistant insuring that radio will remain protected from water. Shower radio can be hung in the shower with the integrated hanger that fits over all standard shower curtain rods, or can sit on the counter-top with the folding pedestal.